Compact and slim, the Sport is a colorful addition to the Phil and Teds line. This is the re-named version of the Navigator. The main seat and hood are removable, allowing more seating options and less bulk. Next, nicer soft matted premium fabric on the seat maintains its rich color. Not only is the fabric better, but you can also mix and match the colors! More information on that later. 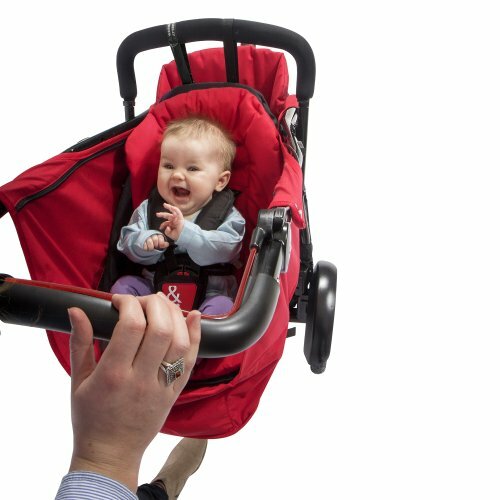 The Phil and Teds Sport has a new shoulder strap adjustment system that eliminates dangling ends sticking out of your stroller seat. I love that neat look. A better pivoting sun canopy has a flip-out visor to shield any angle of the sun and it has side storage pockets. Mix up the canopy colors to change your look. 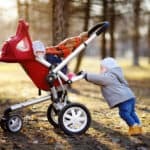 These are the improvements, and the time you finish reading this page on the Phil and Teds Sport you will discover all the exciting features that make this one of the best all-terrain strollers out there. Let’s get started, shall we? 2 Plenty of seating options! 3 Tell me more about the main seat. 5 And the sun canopy? 8 What others are saying. 10 Where should I buy this product? Customized colors for canopy and seat liner – mix and match! For newborns: Take the main seat off and snap a car seat right onto the chassis (via an adapter) for an all-terrain travel system. Separate adapters are available for these car seat brands: Peg Perego, Graco, Maxi Cosi, and Chicco. Stability with the car seat on the Sport is designed with maximum safety in mind and is in accordance with market safety standards. This gives you needed reassurance that three-wheelers are stable as a travel system. 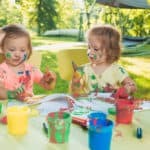 For newborns & toddlers: Mom of two? An essential accessory to buy is the doubles kit The rear seat holds up to 33 pounds, has a sun canopy and reclines. A sophisticated way to go with your newborn is to use the new Snug Carrycot, and you have a modern 3-wheeler pram. Tell me more about the main seat. A padded five-point safety harness secures your child comfortably to the seat and now the harness is designed to be “tail free” so there are no dangling loose ends from the shoulder straps. 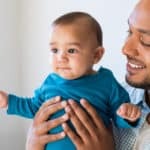 Keep it tidy and keep the ends out of baby’s mouth. I also like the jazzy-looking buckle cover. Phil and Teds Sport features a state-of-the-art Seat Performance System which uses a carefully contoured seat that supports your child upright and provides in aiding better posture. Your little passenger won’t get too hot either because the seat has holes in the back for ventilation. A mum from Australia comments on how comfortable her 11-month-old looks in the seat. Infinite recline positions are one-handed with a strap – get that angle just right while your child sleeps. No jostling the seat while you wrestle with a drawstring. I like how the upright position sits up straight. And in the photo – look how flat it reclines! And I like the head enclosure at the top of the seatback for added security. How can such a big kid ride in this stroller? The seat is quite wide at 13 inches and the seat back is nice and high at 24 inches. The main seat canopy is also tall enough to leave enough space for your child’s head, especially since you can now slide it up the frame a bit. That’s such a nice touch. A child riding in the main seat can weigh up to 44 pounds and the child in the double attachment accessory can weigh up to 33 pounds. Customers reviews say time and again that they love the simple, easy, compact fold. Just engage the brakes and lift the seat pad to find two red slide buttons, for left and right-handed use. Slide the release button with your thumb as you squeeze the grip as the seat folds backward. In one swift motion, your Sport folds in half. 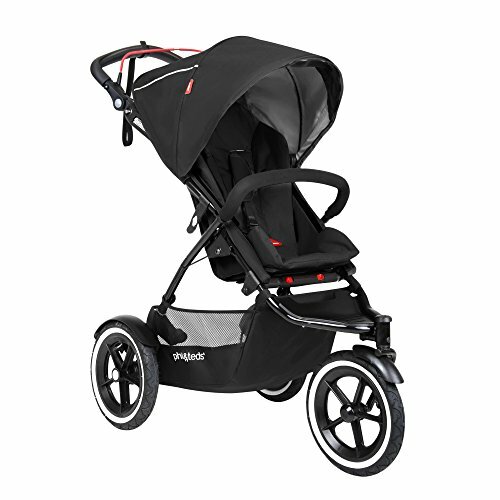 An automatic frame lock latch secures the stroller together for storage. Pop off the wheels for more compact space. You’re going to love the sun canopy; this hood pivots forward to follow the sun. No need to purchase one of those canopy extenders to shade your child adequately! A flip-out visor provides additional protection. It can also adjust up the frame to accommodate taller children. 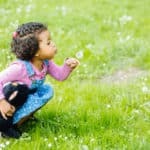 Your child is well-cared-for in the Sport, but you’re certainly not neglected! One of the convenience features both parents enjoy is the height adjustable handle. 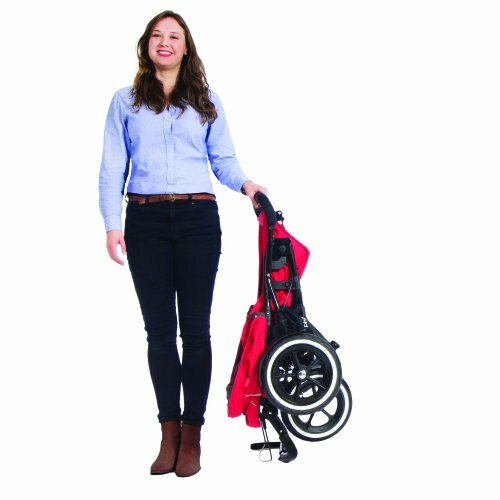 Whether you’re a petite mommy or a daddy over six feet tall, the handle on the Sport provides nine different positions to find the sweet spot for comfortable strolling, whether it is you or your “little helper”. Then you have the storage basket beneath the seat. It’s a nice size, though some parents wish it were bigger. Keep in mind that the this storage basket is where your second child’s feet go when using the doubles kit, so that’s going to limit your space a little bit. Pockets on either side of the sun canopy provide a place to store a few of your small things. One reviewer says these pockets are sturdy enough to hold a water bottle. One of the most frequent compliments this stroller receives is how well it maneuvers. It’s just like a single when you’ve got the doubles kit attached. 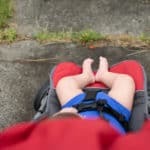 In a recent review, one mother says she can push one-handed and because of the narrower width, she doesn’t have to feel like a sidewalk hog. I just love the brake pedal; Phil and Teds think of everything! All you have to do is step down once to engage both back wheels securely. Flip it back up to go; it can’t get any more simple than that! In addition to the five-point safety harness, your Phil and Teds Sport comes equipped with a safety tether to maintain contact should you decide to jog with it. A tether around your wrist is used in case you trip and fall, your stroller won’t get away. It also keeps you in physical contact with your stroller at all times, like at an intersection as you wait to cross. For me, I’ve always needed that connection that brings me peace of mind. The three 12-inch air filled tires give your baby a smooth ride and make it easier to push. “Like floating on air,” as one reviewer describes it. While it certainly becomes more challenging as your children grow heavier, the tires are definitely a help. Keeping a tire pump around is a must, though. And now here’s an exciting update! The Sport is now the first inline to offer an auto-stop feature. 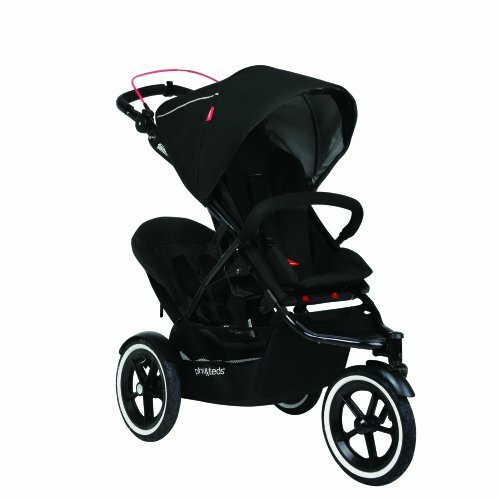 It is a braking system linked to the handle and if you let the handle go, for any manner of reasons as we busy parents might be prone to do, your stroller automatically stops. What an amazing concept! The red thin metal lever aligns with the handle, as you see in the video below. I also like that it has a way to hold the lever to the handle so you don’t have to continue to squeeze it to keep the brakes disengaged. This new stroller has been getting outstanding reviews. Parents recommend the Phil and Teds Sport for the one-handed fold, and the compact size and weight for either single or double version. The air-filled tires give an incredibly smooth ride and easy maneuverability. “Like riding on air” is how it is described by happy parents. 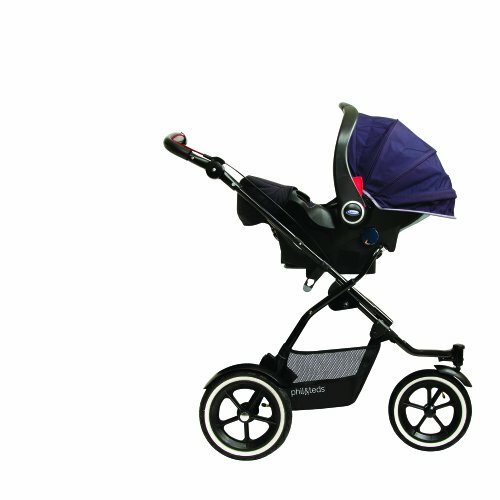 Parents also remark on such features as the comfortable adjusting handlebar and that they don’t kick the back of the stroller. So far complaints are few and far between, but there have been more than one comment about the storage basket size. While some moms say they can fit a bag of groceries into hers, others say that they wish they could. And in doubles mode, the rumble seat sits closer into the main seat, providing less clearance for your toddler to get in. The Sport does not fold with the rumble seat attached. Lastly, a couple of complaints are about the padding on the seat – it is Velcro attached on the bottom, but not on the seat back, so when some kids get into the seat, the seatback padding scrunches down and bunches behind the child. Where should I buy this product? I regularly check prices and I always recommend that you buy from Amazon for both the single and double Sport. You can get all the accessories you need there too. 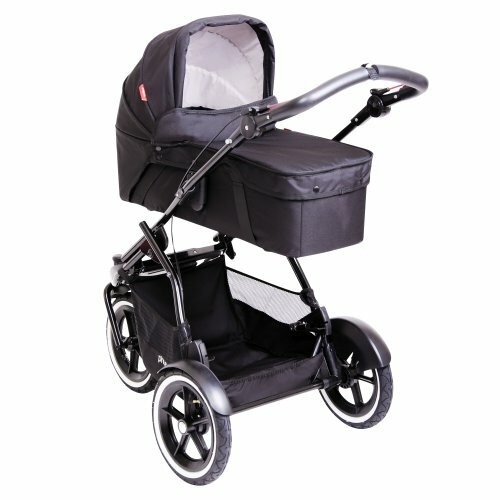 Just imagine how exciting it will be when your stroller arrives and you can take it around YOUR neighborhood in style!